- Destroy 1 Spell Card or Trap Card on the field. - Send 2 cards from the top of your opponent's Deck to his/her Graveyard. Not much yet, wait until the 3 other Dark Scorpions, The Dark Scorpions Assemble & Dark Scorpion Combination to come out in the Dark Crisis set. While he's not as strong as Don Zaloog, and doesn't contribute to Hand Disruption, Cliff is a nice tech card for taking out opposing Imperial Orders, Gravity Binds, Messenger Of Peaces or anything other Spells or Traps that are in the way. Until the rest of the Dark Scorpions come out Cliff may not see much play, or at least not as much as Don gets. You can also team them together with Needle Worm, Morphing Jar and Card Destruction to make a Deck Destruction Deck, but they aren't too big at the moment with Morphing Jar and Needle Worm being incredibly hard to acquire. 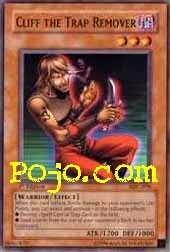 Besides using Cliff in Deck Destruction or Dark Scorpion Decks, he fits nicely in Clown Control or anything Deck that relies on Gravity Bind or low ATK Monsters. Though without and protection or Equip Spells it may be hard to keep him on the Field for more than a turn or two, so he should really be used with caution and some planning, yeah... like anybody plays or builds a Deck without planning it out first. ArtWork: 2.0 - Nothing special, but he looks like he'd be the nerd of the Dark Scorpion gang, running around dismantling Traps while the others go on killing and looting sprees. Lets talk about being counter productive. Because this card literally defines it. First I'll begin with the stats. It's your basic Gravity Bind efficient Monster. A solid 1200 ATK for Three Stars. Some more ATK Points would have been nice, but whatever. It probably won't see much play anyways. Now to the possible Effects. Having the option of one of two Effects in interesting, but it doesn't necessarily make it playable. Wow... Take a look at your first option. You have the ability to nuke a Spell Card or Trap Card whenever you deal Battle Damage to your opponent. It may seem nice and all... But is it really? No. If your opponent has something in his Spell/Trap zone, chances are it's either a Trap or Quickplay Spell. And almost every playable Spell/Trap is able to either Chain to the Summon or Attack of your Cliff the Trap Remover. There are very few, if any, competitive decks that Cliff the Trap Remover will give you an advantage over. The only time when you will consistently be able to Destroy mass Trap card(s) is if you have Jinzo on the Field as well. Although, if you have Jinzo on the Field, your opponent's Trap card(s) aren't doing you any harm regardless. I'm not going to bother going into his other optional Effect because Deck Destruction is one of the weakest deck types currently. Overall, Cliff the Trap Remover is one of the most counter productive Monsters in the entire game. He isn't Main Deck worthy, although, he is a decent Side Deck candidate when you're up against a solid Gravity Bind/Messenger of Peace based deck. * Destroy 1 Spell Card or Trap Card on the field. * Send 2 cards from the top of your opponent's Deck to his/her Graveyard. Cliff the Trap Remover is one of Don Zaloog's cronies with a pretty decent effect on his own. Being able to destroy a Spell or Trap Card on the field gives you yet another way of destroying Imperial Order besides Breaker. Destroying any of your opponent's Spell or Trap cards is always a good thing and if he/she doesn't have any, there's always the deck destruction option. Unlike Don Zaloog, Cliff is only 3 stars which gets him underneath Gravity Bind. In some ways, Cliff is as good as Don Zaloog - both get you card advantage...one is from the hand, the other from the field. Also, being a Dark Type means Mystic Tomato can summon him and being a Warrior makes Marauding Captain very happy. 1200 ATK isn't very high and won't really kill many things but that's also good in some ways since you don't want any of the Mystic Tomato vs. Don Zaloog nonsense that happens. (Suicide Tomato and Don, Special Summon a Don with Tomato's effect). I've got to say that I really like Cliff the Trap Remover. He's got a decent effect and is a very flexible and versatile monster. He'd be great in a Warrior Deck and can compliment Don Zaloog pretty nicely in a Hand Disruption Deck.